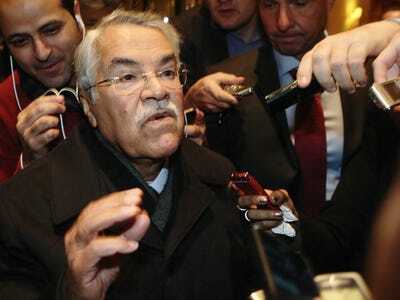 REUTERS/Heinz-Peter BaderSaudi Arabian Oil Minister Ali al-Naimi at his hotel ahead of an OPEC meeting in Vienna on Monday. Good morning! Here are the major stories to be aware of before markets open in the US. Oil Prices Barely Budge. Brent crude oil prices are at $US78.64 per barrel, up 0.4%. WTI crude oil prices are at $US74.19, up 0.1%. Prices are right near four-year lows. HP Comes Right In Line With Expectations. HP’s Q4 earnings were right in line with expectations, while revenue missed by a rounding error. “I’m excited to say that HP’s turnaround continues on track,” CEO Meg Whitman said. HP Execs Hint That More Layoffs Are Coming. HP has laid off 41,000 people (with about 9,000 people left to go) under its current downsizing plan for 2014. On Tuesday, the company hinted that more layoffs could be coming with its plans to separate itself into two huge companies. Markets Are Up. In Europe, Britain’s FTSE 100 is up 0.2%, France’s CAC 40 is flat, and Germany’s DAX is up 0.7%. In Asia, Japan’s Nikkei closed down 0.1% and Hong Kong’s Hang Seng closed up 1.1%. Dow futures are up 17 points and S&P futures are up 2 points. Uber Will Be Valued At $US40 Billion In New Round Of Funding. Uber is close to raising a new round of funding that would value it between $US35 and $US40 billion, according to Bloomberg. T. Rowe Price is said to be among the new investors. Samsung Just Sold Off Stakes In Chemical And Defence Units For $US1.7 Billion. Samsung Group said on Wednesday it is selling stakes in defence firm Samsung Techwin Co and three other units for 1.9 trillion won ($US1.72 billion) to Hanwha Group units. Management also announced a $US2 billion share buyback plan, the first buyback plan since 2007. Here Comes Data. There’s a ton of US economic data being released today. Durable goods, personal income and spending, and jobless claims come at 8:30 a.m. ET. That will be followed by the Chicago Purchasing Managers Index at 9:45 a.m. and Univ. of Michigan Consumer Confidence at 9:55 a.m. At 10 a.m., we’ll get pending home sales and new home sales. Check out Business Insider’s Monday Scouting Report for the full preview.